With Warner Bros ramping up it latest DC Comics tentpole Justice League, the studio today unveiled the first look at Amber Heard in costume as Mera – and she looks pretty badass. It’s been a rough few years the comic book giant DC. Everything non-Christopher Nolan-related – Suicide Squad, Batman Vs. Superman, Green Latern – has been a bit of a mess. Not to mention everything that their biggest competitor, Marvel, touches seem to turns to gold. But DC might be breaking their unlucky streak if this first look at Mera is anything to go by. Heard – who you may remember from The Rum Diaries, The Danish Girl, Magic Mike XXL or the infamous Johnny Depp divorce – is set to play Mera, the wife of Aquaman (played by Game of Thrones favourite Khal Drogo aka Jason Momoa) in Justice League. 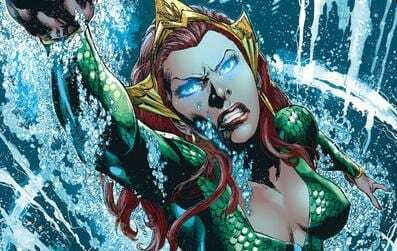 If you’re unfamiliar with Mera’s many talents, in short, she has the ability to manipulate water on a grand scale and form objects. And she’s pretty badass – she’s also a natural-born leader, having spent a long period of time governing a colony of exiles while simultaneously training for battle. So she probably shouldn’t just be referred to simply as ‘Aquaman’s wife’. Heard will be starring alongside Ben Affleck, Henry Cavill, Gal Gadot, Ezra Miller, J.K. Simmons, Ray Fisher, and Jason Momoa as Batman, Superman, Wonder Woman, The Flash, Commissioner Gordon, Cyborg, and Aquaman respectively. The movie is set to drop in November 2017.